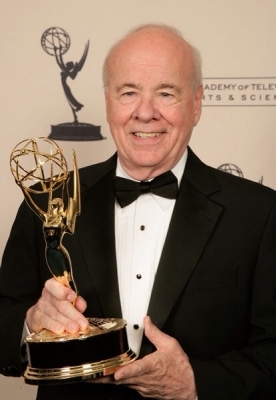 I listen to his son, Tim Conway, Jr. on KFI in Los Angeles. He relates about a lot of his old man's comedy on "McHale's Navy", and "The Carol Burnett Show." Son takes after his father. A bit of trivia: His real name is Thomas Conway. But there already was an actor named Tom Conway, so he became Tim. Here's the clip. Some say this is the funniest unscripted bit ever on TV! A few years ago, I was listening to a sports-talk radio station the afternoon before Carol was to do one of her "one-woman show" things in Portland... It so happens the two afternoon sports guys were big fans of hers and somehow had managed to get an interview with Carol. Sitting in her hotel room, she did an entire hour talking about her live show, her old TV show, and Tim Conway among other things. Absolutely fascinating hour of radio, one of the best I ever heard... Anywayy..
Find the skit on Youtoob from the Carol Burnett Show where he does his "siamese elephants" routine. Everyone is breaking character trying not to laugh. Everyone, that is, except "Mama" - who tops Tim with her amazing one-liner! !